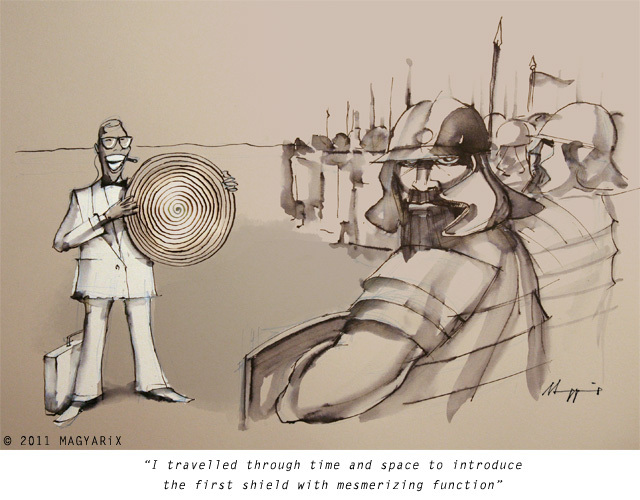 "I travelled through time and space to introduce the first shield with mesmerizing function." Oh no!!! It's a time-traveling solicitor. When that day comes there will be no place to hide from them. EEEEK!!! Could they pop up in your bathroom, I wonder?? The soldier in the foreground is looking at us thinking; Why me?? Funny. A nightmare. But a well drawn one. Love the facial expressions... and the white gives such a nice touch and emphasizes the time traveler. Very fun! Great! Love the idea..another deep thought one from you! A travelling shield salesman..wow!! Drawing..excellent again!